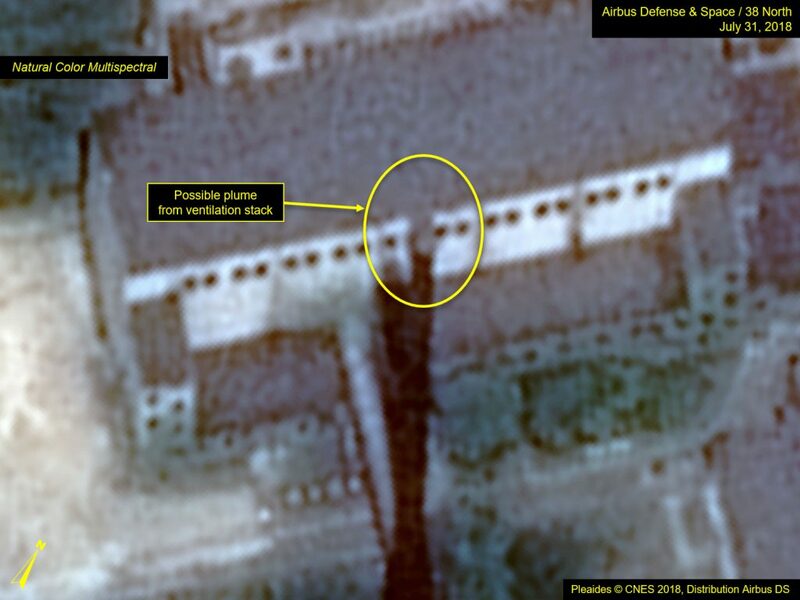 Commercial satellite imagery from July 31 of North Korea’s Yongbyon Nuclear Scientific Research Center indicates ongoing work on the secondary cooling system for the 5 MWe reactor. A low-flow discharge is observed coming from the pre-existing cooling water outfall pipe, indicating the reactor is most likely not operating but that residual heat from earlier reactor operations is being dumped. Imagery also indicates continued vehicular traffic in and around the 5 MWe reactor and Experimental Light Water Reactor (ELWR), although there are no observable signs the ELWR has started operations. 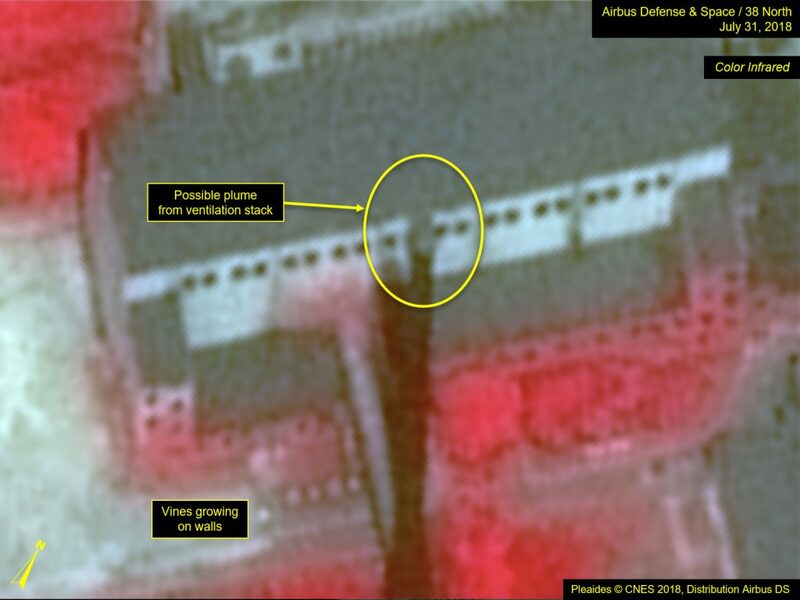 Activity around the Radiochemical Laboratory, where plutonium reprocessing is conducted, remains at low levels. Imagery is of insufficient resolution to confirm whether a small plume is coming from the ventilation building’s ventilation stack. 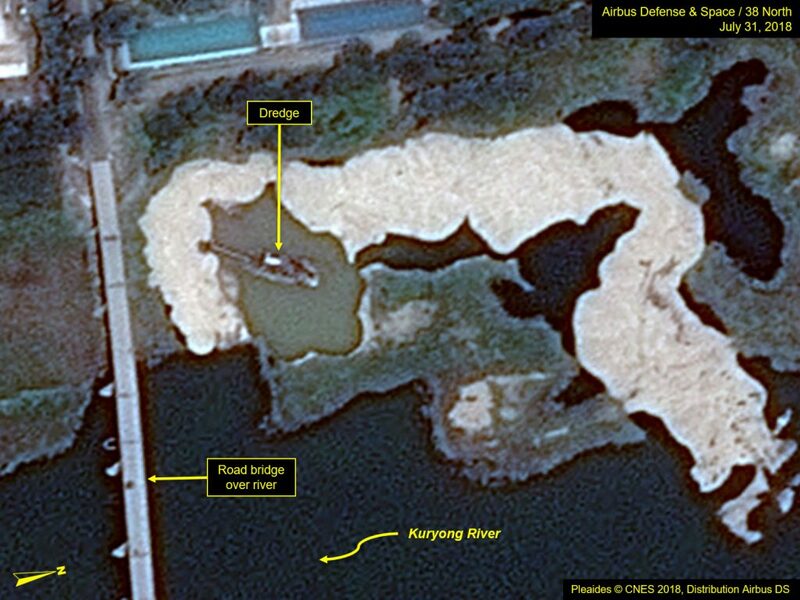 Commercial satellite imagery from July 31 indicates that dredging of the Kuryong River continues next to the new pump house associated with 5 MWe reactor’s secondary cooling system, suggesting that modifications may not be complete. (Figure 1) Notably, a discharge is observed coming from the pre-existing cooling water outfall pipe, albeit at a low flow. 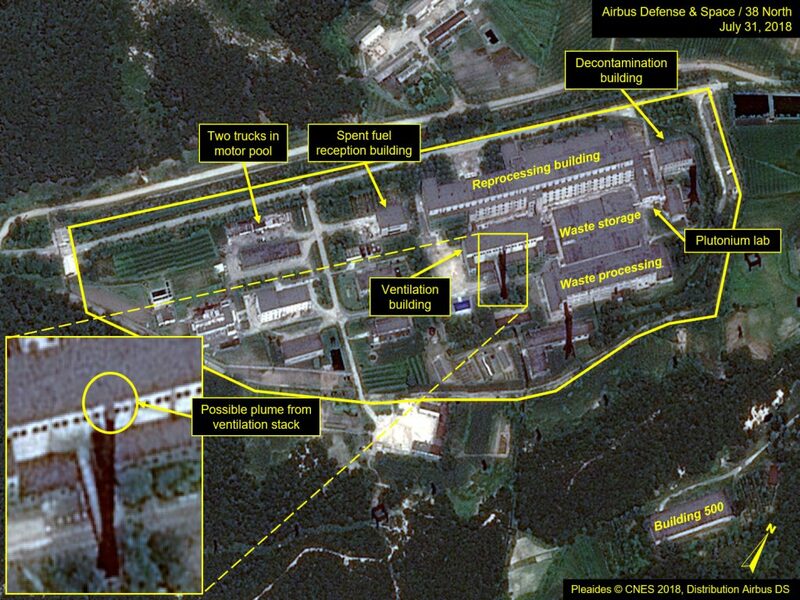 The low flow rate indicates that the reactor is most likely not operating but that residual heat from earlier reactor operations is being dumped. This development raises questions about the role of the new pump house, which had been thought to potentially serve as a new outfall to minimize the signs of reactor operations. Figure 1. Dredging continues near the 5 MWe reactor’s new pump house and low flow discharge observed from pre-existing cooling water outflow pipe. Given this development, it is unclear if testing of the modified cooling system has been completed. What we had last reported as an apparent subtle mixing/eddy interface of water from the pump house may have been simply the mixing of the dredged channel lagoon’s still water with the Kuryong River’s more turbid flow. 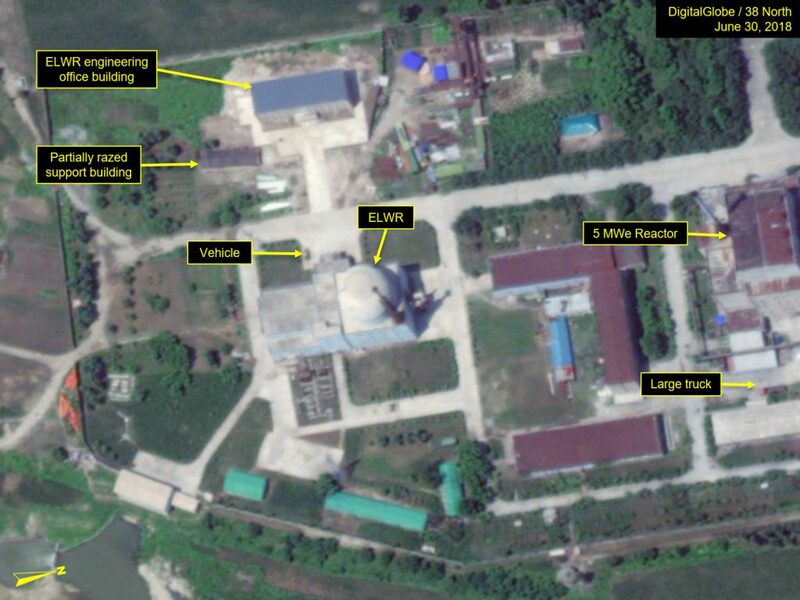 It is also possible that, if the North Koreans had been testing the new system, they could be doing some additional modifications, requiring the old outfall to be used again to remove the residual waste heat from past reactor operations. 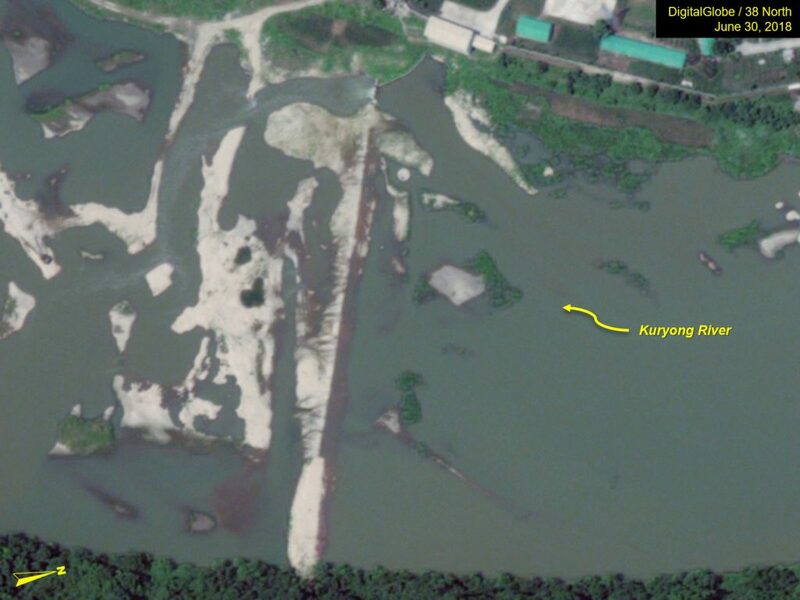 Dredging also continues on the west bank of the Kuryong River in an area located immediately north of the main river bridge. (Figure 2) The purpose of this activity is still unclear, but the operation seems substantial. Figure 2. 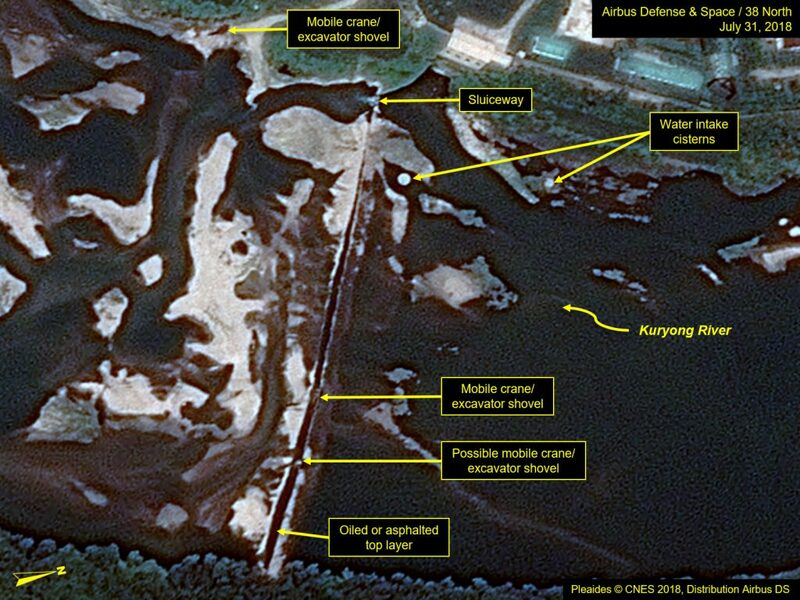 Dredging continues on the west bank of the Kuryong River. Figure 3. Improvements are being made to the earthen dam forming the reservoir across the Kuryong River. Figure 4. 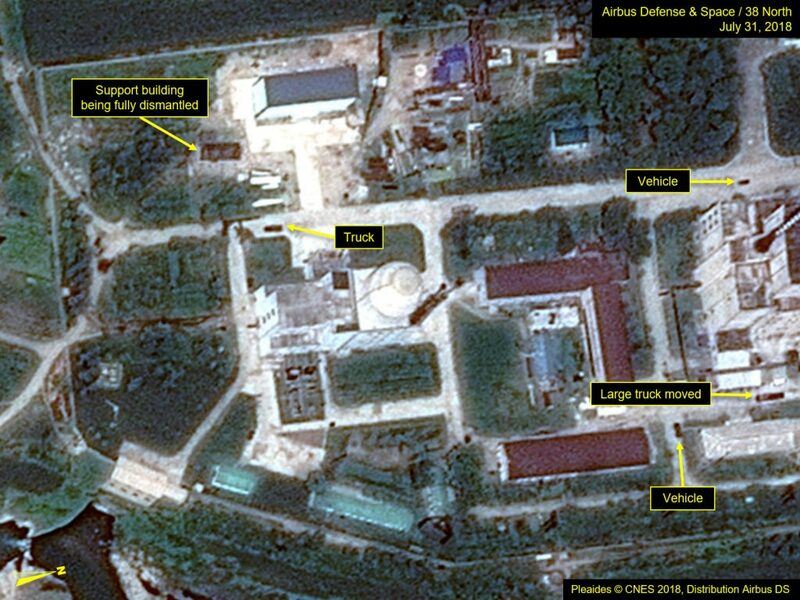 Traffic movement continues between the ELWR and 5 MWe reactor. Activity at the Radiochemical Laboratory appears to be at low levels. Two trucks are present in the motor pool, which is consistent with what was observed in our previous report. And coal bin levels at the thermal plant are low, which is typical in the summer and when there is no ongoing reprocessing campaign. Figure 5. Low levels of activity at the Radiochemical Laboratory. Figure 6. Possible plume from ventilation building stack. 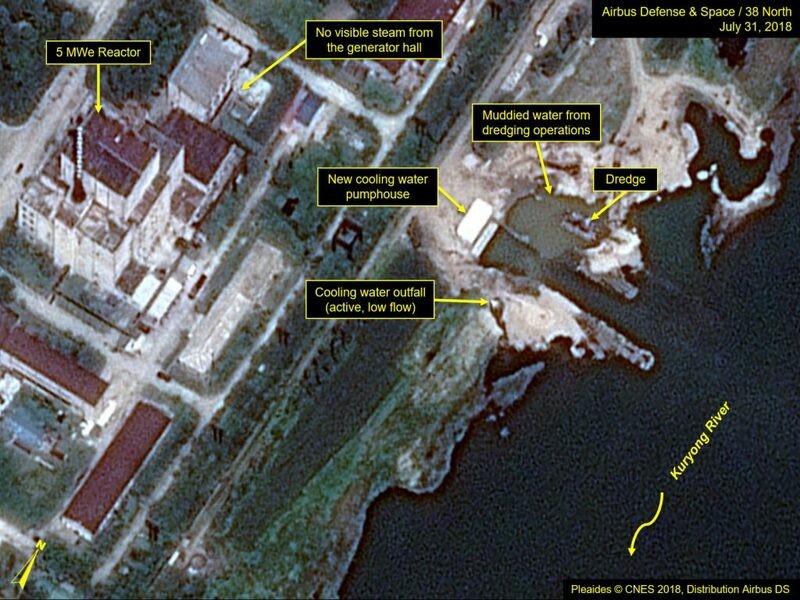 No significant activities are observed at the Uranium Enrichment Plant or the Radioisotope Production Facility where infrastructure improvements were recently completed.